While preparing a syllabus for psychology, seminar was proposed to orient students to the application of psychology to current social context. Students responded positively to the themes Art, Culture, Gender and Human Behaviour. They also identified other adolescent issues like Cyberpsychology and Consumer Behaviour. This work is the outcome of two seminars organised by the students of psychology. 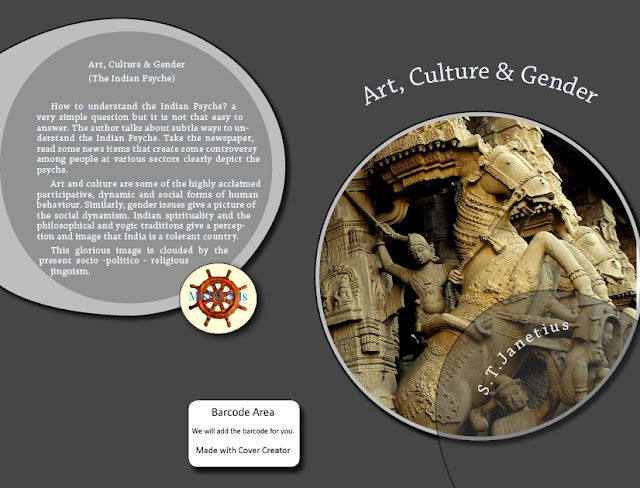 The papers in the book reflect the changing Indian culture and modern Indian Psyche in various aspects. Art, Culture and Gender issues reflect the human psyche down through the history. India is a multicultural, tolerant society with its complex traditions, beliefs and thinking, which is distressed by various socio-political and religious elements today. However, the glorious India is admired for its tolerance and multiculturalism. Due to pressure groups and fanatic outfits emerging in the society, India is slowly losing its original social outlook and tend to move towards a bigoted society. Multiculturalism is a beauty, as we see different flowers in a garden. The fascist ideology that is often propagated by fundamentalist groups spoil this beauty of Indian society. In this regard, India needs some dynamic personalities who can propagate, educate and inculcate the glorious values of humanism and work for tolerance and harmony. I would like to thank the students Aksa, Alimiyan, Ann Varsha, Gowthami, Hashir, and Naveen for their efforts taken in this regard and the other scholars who worked with them in their endeavours to create an awareness to enlighten the young minds for a better Indian society.